On February 10, 2016, Wednesday, an official meeting was held under the chairmanship of King Gustaf at Stockholm Royal Palace. 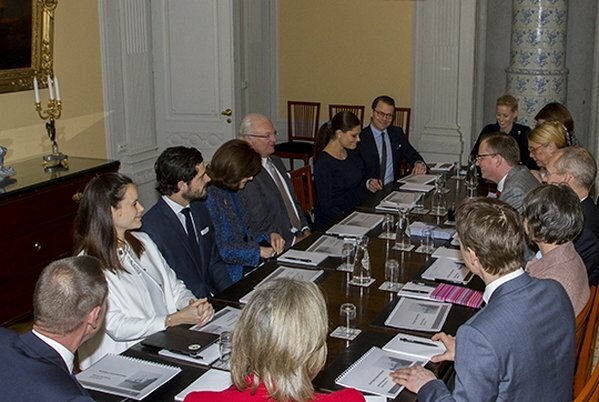 The meeting was attended by King Gustaf, Queen Silvia, Crown Princess Victoria, Prince Daniel, Princess Sofia, Prince Carl Philip and Mikael Damberg, Minister of State, Oscar Stenstrom, General Director of Political Affairs, Eva Walder and Karin Olofsdotter, Deputy Undersecretary. I think maybe it's the angle of the photo, but this table looks narrow, makes it look like people across the table are sitting too close to each other.